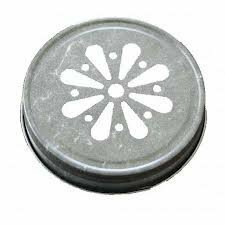 This is a set of 12 (1 Dozen) Pewter colored Daisy Mason Jar lids, the center hole fits paper straws perfectly! Add a piece of cloth or paper between the jar and lid and fill with candy or party favors, these are perfect for weddings, outdoor parties, really anything! These fit any regular mouth standard mason jar. Please note that a secondary seal is not included with this item. The top is open when placed on the jar. If you have any questions about this product by piecestoparty, contact us by completing and submitting the form below. If you are looking for a specif part number, please include it with your message. Ball Regular Canning Mason Jar Lids and Rings, 1 dozen (or 12 lids and 12 bands total) Plus combined with One (1 cap only) Ball Plastic Regular Cap.